I first discovered Haley Reinhart when I came across a YouTube Video of her singing a cover of "Creep" by Radiohead. I was blown away. I looked up all of her other stuf on YouTube and my fandom kept growing. It just kept getting better. A little more research on HaleyReinhart.com revealed that she is a native of the Chicago area. She placed third in the tenth season of American Idol and her rendition of Bennie and the Jets was ranked by E! Online as the 14th best AI performance of all time. She was ranked similarly high on several other AI lists, too. Since AI, she has performed solo and as part of Postmodern Jukebox. She also has appeared on stage with her musician father Harry. She is fantastic in any of those combinations. I had the pleasure of seeing Reinhart perform last summer and met her prior to the show. She was as friendly as could be and just adobable. 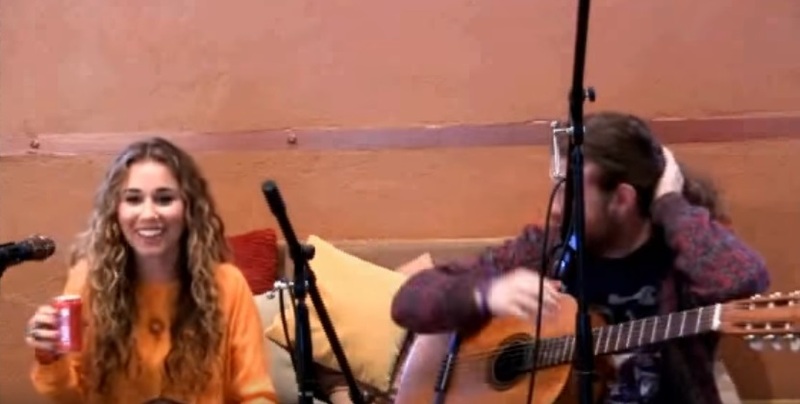 I thought my opinion of Reinhart was about as good as it could be, when I came across Casey Abrams and Haley Reinhart "Caley" Stageit on YouTube. Around the 19 minute mark, Reinhart reaches over to a nearby table, grabs a Coke and proceeds to take a big swig (see visual proof below). Thee you have it. The perfect woman. She is as cute as can be. She sings like an angel, but can also belt out a rocker. Plus she likes Coke! Now if only she liked men twice her age, I might be in heaven. I remember her from American Idol ... great singer! !